This is a special place. Waterfalls so tall you can't even see where they begin. Long Exposure Selfie sitting on a log under the falls. No matter how far you back up or how far you climb up, they seem to come from infinity. There is a sense of solitude, no matter how many people are present. They are dwarfed by the falls. It's a much different sense than Niagara, or really anywhere else I've seen waterfalls (New England, Hawaii, New Zealand, etc). It's powerful, but you can become a part of it, and stand in them, or around them. 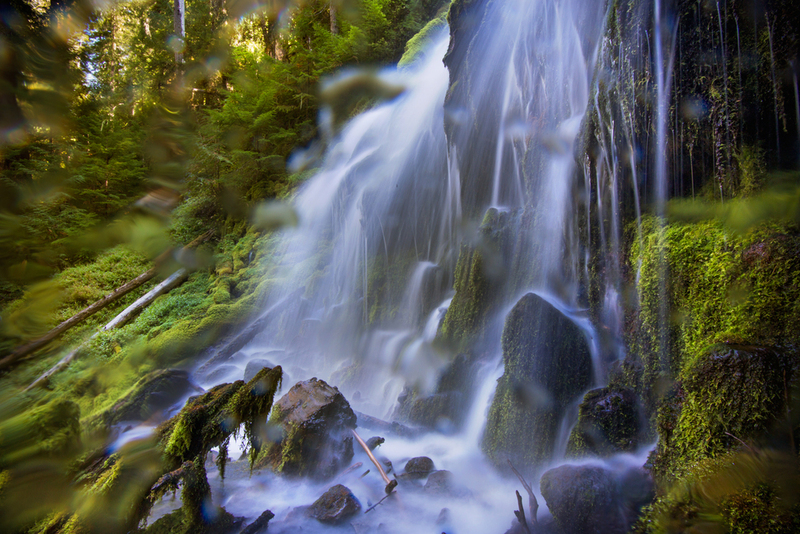 Viewing Proxy Falls from afar. Taking the route less travelled. The place is covered in blankets of moss, and you are almost always sprayed with a cool mist. It's more like a place out of a mythology or a fiction. It's almost doesn't feel like it's a place for humans, but you feel lucky for the privilege to be experiencing it. I don't know the stories, but I imagine this must have been be a sacred place to someone; there is a power here. There are fallen trees everywhere. Not saplings. These are giant trees you couldn't spread your arms around, house size trees you could walk across.